The Thunderbolt 3 to 1394 FireWire adapter connects your FireWire peripherals to your Thunderbolt 3 computer. 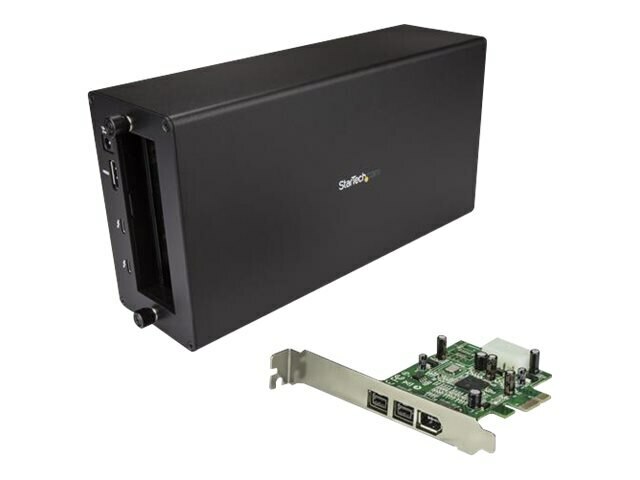 This adapter combines StarTech.com’s Thunderbolt 3 PCIe Expansion Chassis (TB31PCIEX16) and 1394 FireWire adapter card (PEX1394B3). The chassis uses Thunderbolt 3 technology, the fastest connection available, supporting your FireWire devices, plus one DisplayPort output and one additional Thunderbolt 3 port. Use your legacy FireWire devices with your next-generation Thunderbolt 3 computer, without having to pay for upgraded peripherals. Both hot-swap and backward compatible, you can assemble and connect this adapter in minutes. Install the PCIe card using only a Phillips type screwdriver, then plug and play with automatic driver installation. The expansion chassis does not support video cards. This expansion chassis does not provide full power delivery but will provide 15W of power, resulting in a slow charge to some laptops, such as the MacBook Pro. When the dock is connected to your host laptop, a charging icon may appear on your laptop's screen. This is only sufficient enough to charge your laptop in sleep state, and charging will require an extended time period. Thunderbolt 3 equipped computer with a Thunderbolt 3 port.